After Lenovo's first attempts at an ultrabook (IdeaPad U300, U400), it tries to follow up with better next generation of devices. 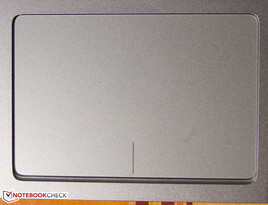 To make its line of ultrabooks stand out, Lenovo uses aluminum for its moderately priced products. The superior quality of construction is not only seen in the U310, but also found in the bigger U410 featuring a 14-inch screen. 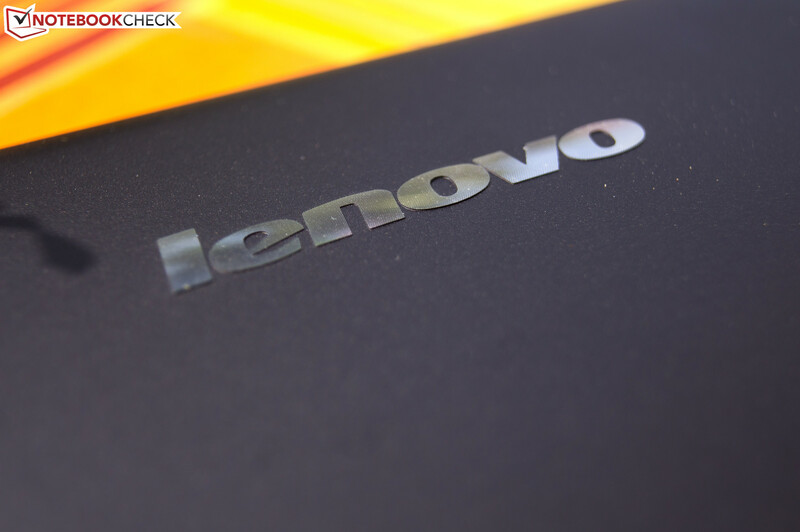 Moreover, Lenovo bundles a remarkable package for a street price of 799 Euro (~US$1000). We will try to pick apart the U410 and expose its shortcomings, if any, for the conscientious buyer. 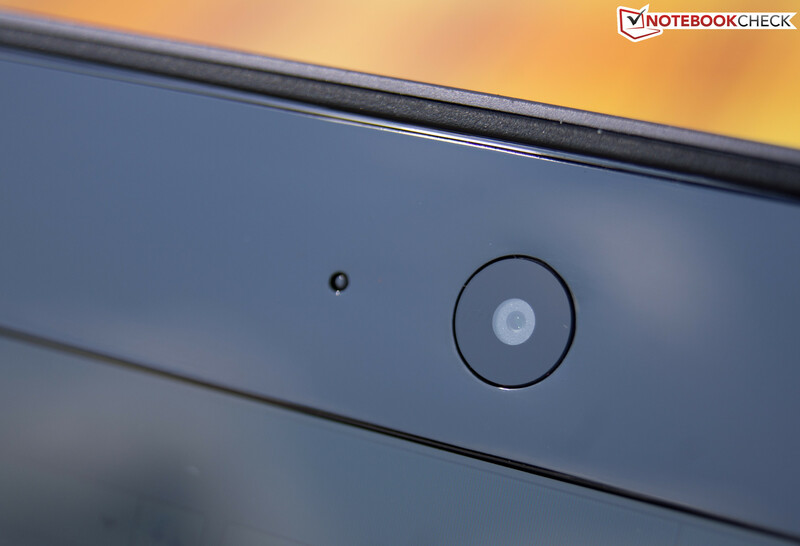 The photographs on the Lenovo website show a slim, well-machined case that is very attractive but in reality, these are sometimes very different. A physical unboxing of the product should give us a pretty good idea of how well the laptop fares in our hands. Relieve it of its packaging and leave it on the table. Take a moment to assimilate the information hitting your senses. This is getting downright prosy. “Wow” is the word that came to mind when we got our hands on the laptop, but opinions can differ. First and foremost, we like the very elegantly processed lid surface. 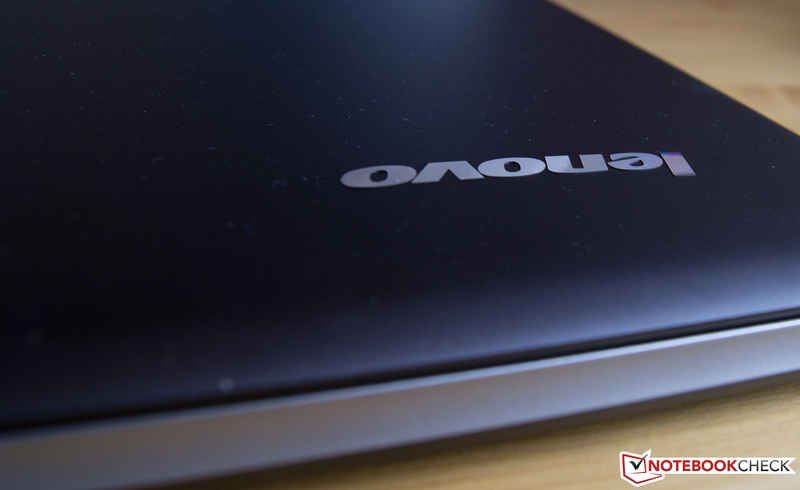 The matte metallic finish glistens when exposed to light and Lenovo's logo gleams in silver. We would say that the design is minimalistic and we could even consider being conservative as one of its attributes. 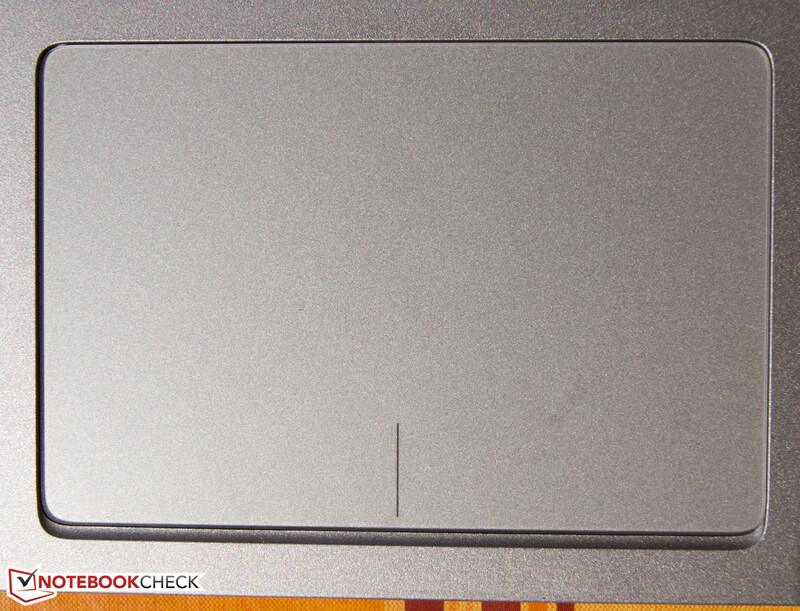 The IdeaPad is not ultra-thin with a height of roughly 2.3 cm, but it is nevertheless very slim for a laptop. 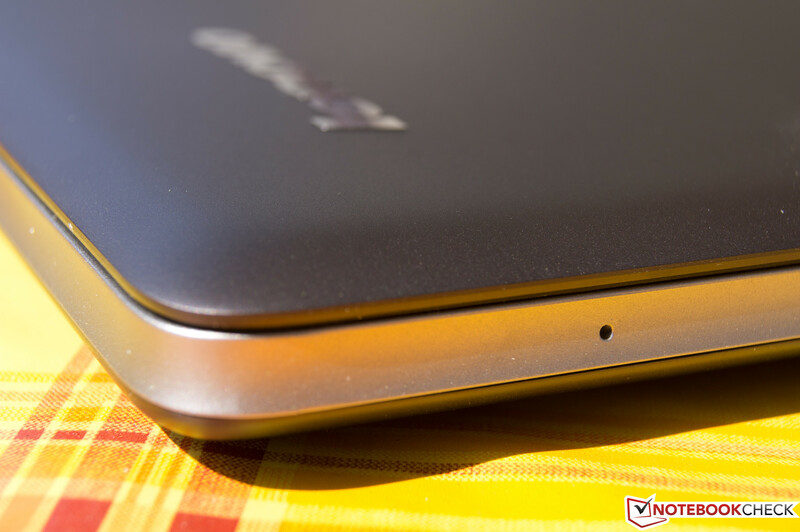 The beveled edges are characteristic of the IdeaPad range. The base is made from aluminum. The design cues are reminiscent of the world famous Apple Macbooks, but that is a good thing in our opinion. However the base is a bit darker than the devices from Cupertino. The surfaces also have a more velvety feel and the edges are pleasantly rounded. The U410 feels uncompromisingly good. Opening the ultrabook leaves us disenchanted for a moment. It is awkward and difficult to open the lid the first time. It closes flush with the beveled edge and has no recess or bulge that would enable us to lift it more easily from the bottom. Opening this laptop is an exercise in patience where the user has to fiddle around with the lid and create a space to pry it open. When you manage to pry the lid open, you will find that the hinges that extend along the length of the keyboard, keep the display in position. The opening angle of 145° is adequate for most people to work with. The screen, considering how thin it is, is sufficiently rigid. The case stability is good with an exception in the center of the keyboard where there is a tendency for flex when slight pressure is applied. We will discuss the keyboard in detail a little later. 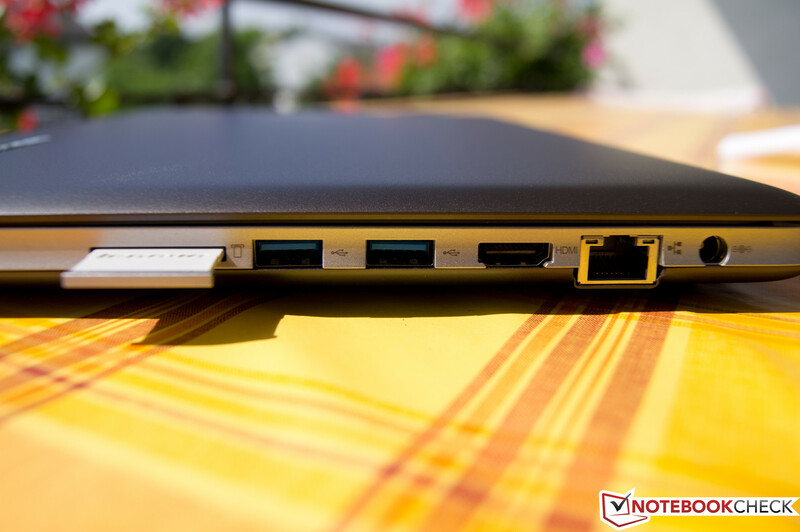 The connectivity options offered by the Lenovo U410 are everything a consumer would want and are well spaced. A total of four USB ports, two of which are USB 3.0, are on the right. The other two USB 2.0 ports are installed on the left. A microphone/headphone combo jack is also present on the left. 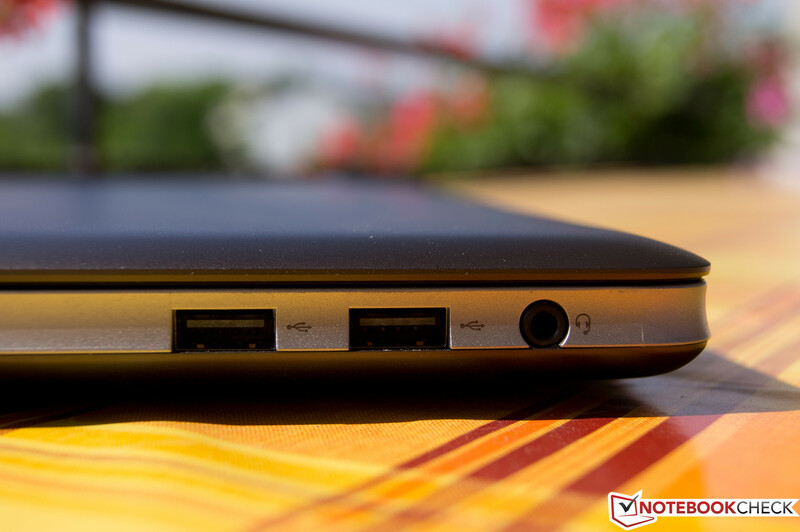 The built-in microphone, SD card reader, HDMI and RJ45 (Gigabit LAN) ports as well as the power socket are on the right. There is no Kensington lock on the U410 but most potential buyers will likely survive without it. The omitted VGA port will be missed much more since many (older) projectors and monitors still use this legacy standard. Newer devices are usually connected via HDMI. The U410 can connect to networks via Gigabit LAN (Realtek adapter) or via wifi (802.11 b/g/n from Broadcom). Mobile broadband is not installed in the U410. However, Bluetooth 4.0 is available. We noticed poor wifi reception compared with other devices while surfing. This could become a problem in bigger apartments with several rooms. A suede sleeve with Velcro is included in the package from Lenovo. But the sleeve offers no form of protection from bumps and drops as it is simply too thin and unpadded. We also question the durability of the sleeve. Since IdeaPads do not feature a docking station, you will have to live with the mentioned interfaces for connecting peripherals. January 14, 2013 update: A handful of U310/U410 owners are reporting significantly reduced wireless speeds, even with a nearby WLAN hotspot. 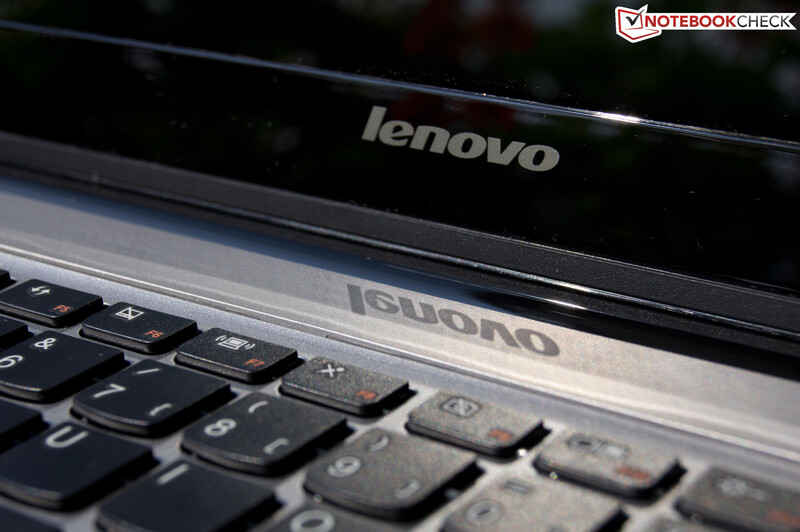 For more up-to-date information, see the official Lenovo forums here. The U410 is a nightmare for people who would like to upgrade their laptops with the latest hardware. There is not a single screw that provides access to the innards of the laptop. Nothing can be upgraded or replaced. The buyer needs to make a choice before going in for this notebook. But, it has to be mentioned that the laptop is pretty loaded for a device at this price-point. The laptop doesn’t come with more than 12 months warranty which is the industry standard for most manufacturers. A scan of the Lenovo website didn’t indicate any possibilities of warranty extension which is disappointing. 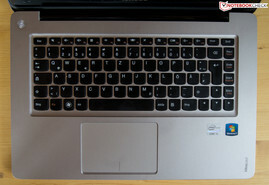 The IdeaPad U410's keyboard looks very inviting and well-arranged. There are no unnecessary keys for proprietary programs that are rarely used and ergonomics has been the top priority when designing this keyboard. As Einstein allegedly once said: "Make things as simple as possible but not simpler". 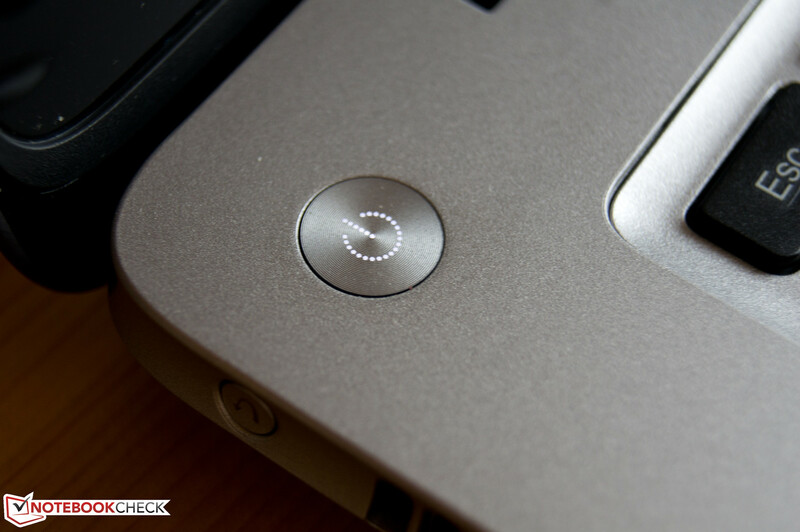 Apart from the standard keyboard keys, there is just the prettily illuminated power button. By the way, this power button is regrettably the only backlit button. A few rivals like HP's Folio 13 or some of Asus' Zenbooks as well as the MacBook Air, offer a backlit keyboard, although not at the U410's competitive price-point. 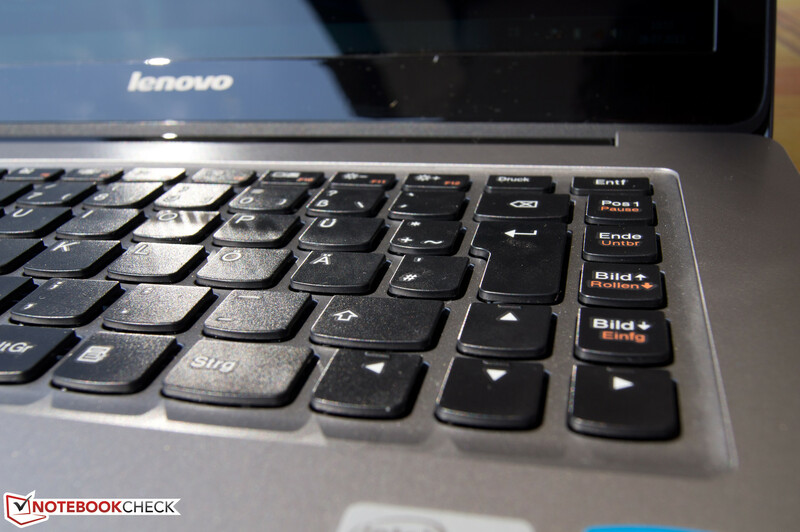 If you can live without the backlit keyboard, you get chiclet-style keys, or as Lenovo calls it in the IdeaPads, an "AccuType" keyboard featuring good, crisp pressure points in keys that are largely easy to type on. The key surface has a velvety feel although they are made of hard plastic. This may sound cheap at first, but it is actually a great thing because the keys have a good feel and do not wear out as quickly as rubberized alternates. The layout of the keyboard on the right edge is annoying and needs a bit of getting used to at first. For example, to gain space for a few function keys (DEL, HOME, etc. 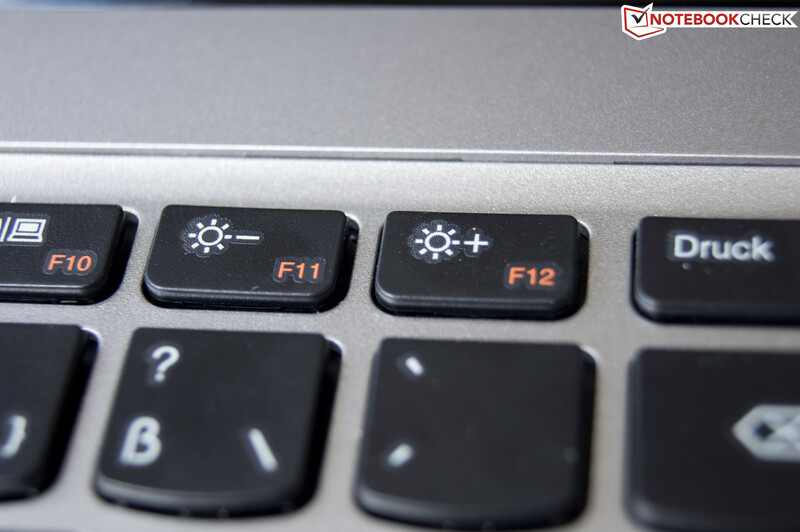 ), the width of the right shift key and all keys above it have been reduced to about 1/3 to gain space. This is also true for the backspace and enter key. 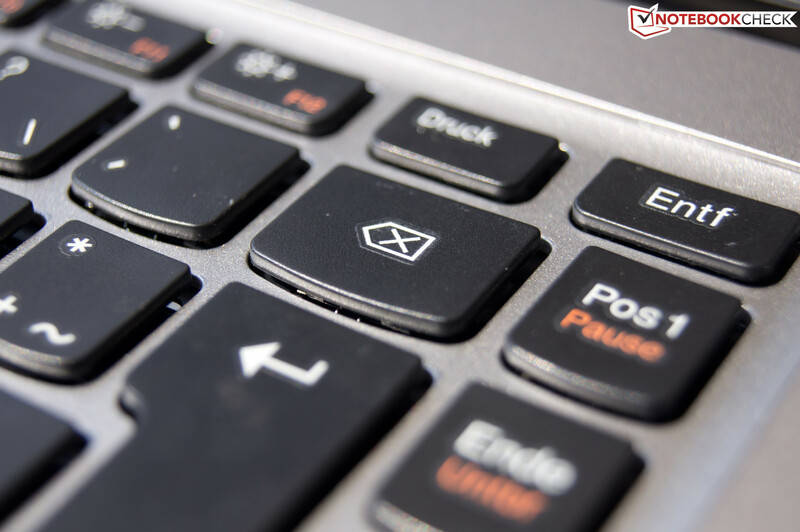 This may not be much of an annoyance when it comes to using the ENTER key, but the same cannot be said for the backspace key that is frequently used. Rather than deletions, you end up hitting the “Home” key and lose your way when typing out a document. However, once you have gotten used to the layout you will likely be pleased with the typing feel. Lenovo blatantly tries to replicate the feel of the touchpads in Macbooks that have long been hallmarks of these laptops. In this case, the implementation has not gone wrong when it comes to the placement and functions of the mouse buttons. The glass surface of the touchpad is pleasant to use and works well in interpreting gestures made on it. For practical use this means you do not have to lift the finger for longer mouse movements and the buttons can also be used for navigating. We never had any misbehavior from the touchpad when interpreting our inputs and the cursor navigates very accurately and intuitively to where it is wanted. The touchpad of the U410 is a click pad with the pressing of the glass surface registering as a left mouse click. The right click is possible when you have two fingers pressing down on the surface together. This is quite a useful feature that many would like to take advantage of. This manner of use makes mouse buttons superfluous anyway. Of course, it is possible to (right or left) click on the touchpad's marked areas with one finger. Lenovo's "Smart Sensor" technology disables the touchpad while typing in order to prevent incorrect entries due to mouse movements. Multi-touch gestures are supported. Pinch-to-zoom and two-finger scrolling responded faster and smoother than on any of the previous PC laptops we have had. The wish to connect a mouse never came up during the entire test. This is what good touchpads should behave like! The U410's 14-inch screen does not provide any really (positive) surprises. Sure, the installed TN screen, a "B140XTN02.0" from AU Optronics, is a standard product that features a resolution of 1366x768 as used in numerous other devices. 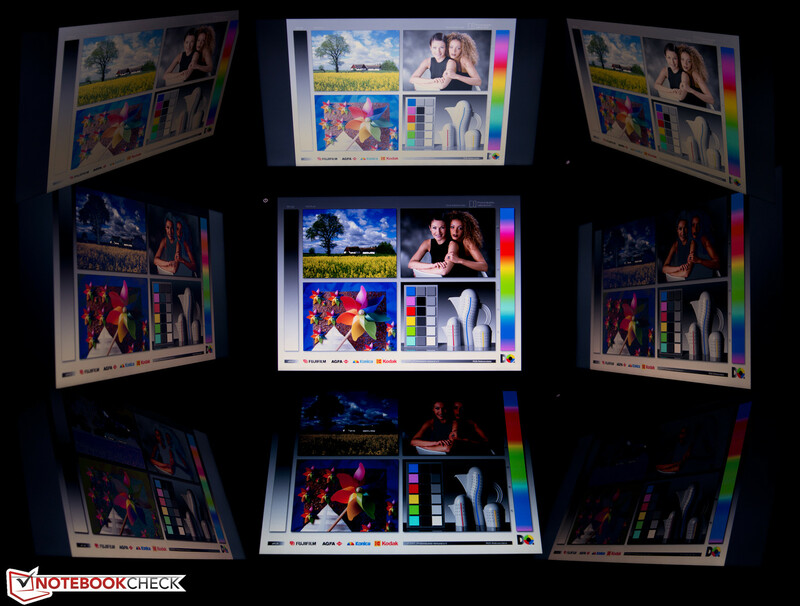 The contrast and the color intensity are similar to other screens with no distinguishing characteristics. 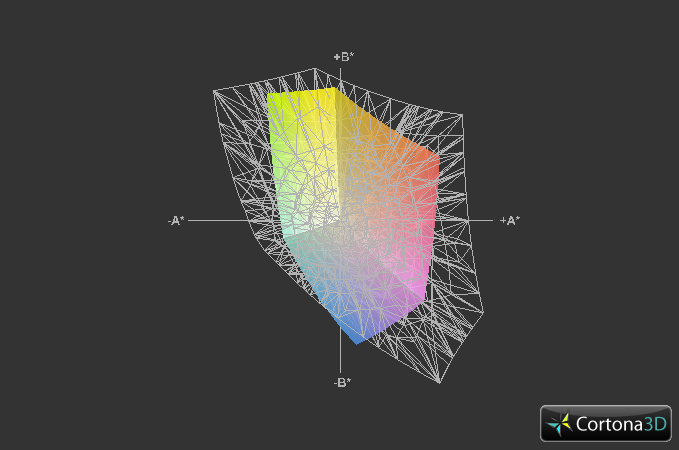 The display resolution is appropriate for this screen size but the colors tend to cooler shades. This screen cannot be compared to other higher resolution screens that are much better in performance. 14-inch notebooks, such as Alienware's M14x, Lenovo's T420 and even (more expensive) 13" ultrabooks like the Zenbook UX31A or Samsung's Series 9 900X3B provide razor-sharp pictures due to a resolution of 1600x900 and 1920x1080 (Zenbook UX32VD). However, the color quality usually does not reach professional levels (e.g. Lenovo W520's screen). The color behavior of the screen is also standard. The sRGB color spectrum isn’t covered much just like the competition. But that is only important for professional use and not as much for normal tasks. Graphic designers and photographers will turn to other, specialized devices (e.g. ThinkPad W520). The U410 was not made for this anyway. We expect a certain degree of portability from an ultrabook due to its compact size, light weight and long battery life. This especially includes outdoor use where a bright, low-reflection screen is indispensable. However, none of these traits really apply to the U410. With 172 - 196 cd/m2, the brightness is enough for all indoor situations as well as in the shade. 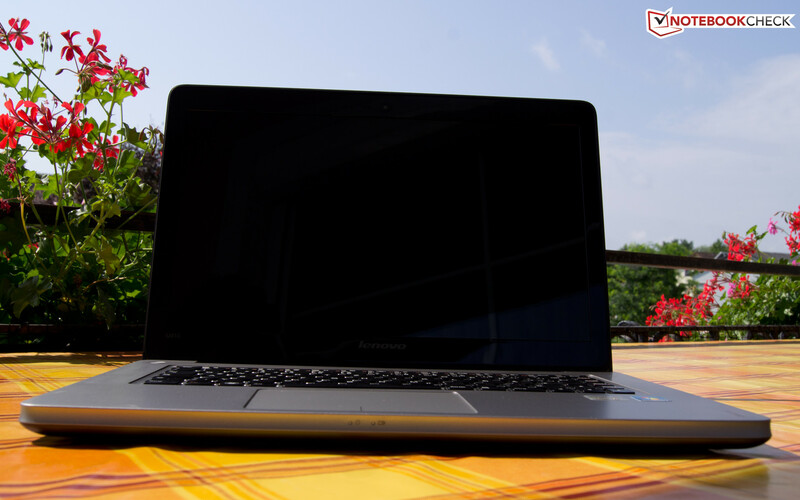 The combination of a glossy screen and only average brightness prevent using the slim unit in sunlight. Hardly anything could be recognized on the screen. The screen convinces with its good viewing angle stability. Vacation photos can be presented to large audiences without needing to fear the depicted image looking a bit pale. The weak contrast of 161:1 results from the high black value of 1.22 cd/m2. The overall impression is acceptable subjectively. We were a bit surprised that the colors were displayed more intensely, particularly the green hues, when switching from Intel's graphics to Nvidia's GeForce 610M. 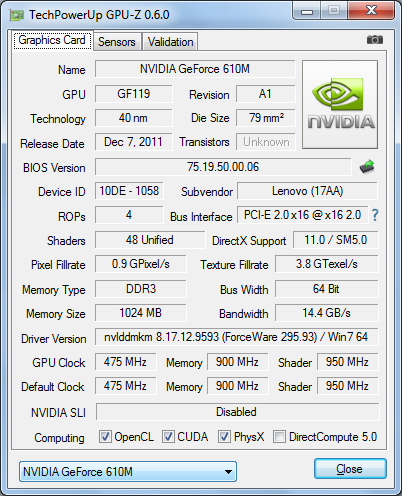 Nvidia likely uses different calibration data in its driver. The IdeaPad U410 is basically available in three versions which only differ in the installed processor. Our 799 Euro test device featuring a Core i5-3317U (2 x 1.7 GHz; Turbo: 2.6 GHz) is the happy middle child when it comes to equipment and price. 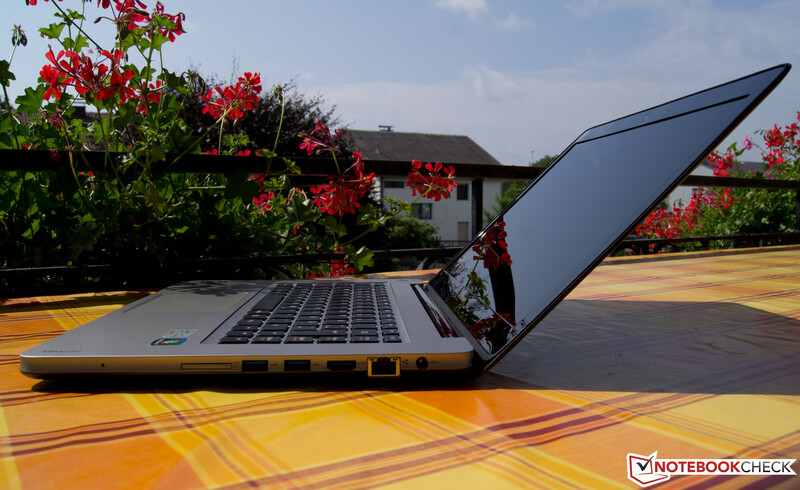 The 699 Euro version offers a comparatively slow Core i3-2367M (2 x 1.4 GHz; no Turbo) and the 899 Euro version includes a Core i7-3517U (2 x 1.9 GHz; Turbo: 3 GHz). All processors have an identical TDP of 17 W, meaning the power consumption and temperature development should be pretty much the same on average with other notebooks. 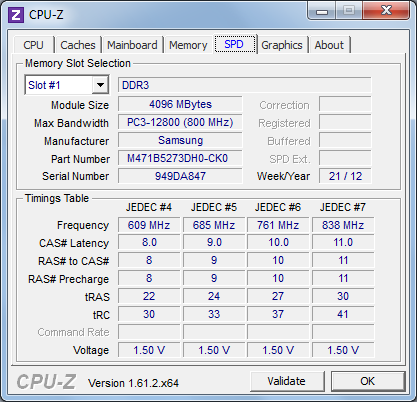 The low-end version does not feature Turbo Boost and stays at a clock speed of 1.4 GHz. 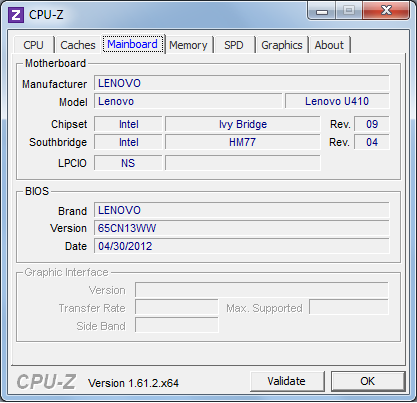 Moreover, the Core i3 processor is from the previous Sandy Bridge generation. This consequently means that the user also has the older integrated HD 3000 graphics card rather than the HD Graphics 4000, if the dedicated GeForce 610M is unwanted. Thus, the price to performance option would be our 799 Euro version. 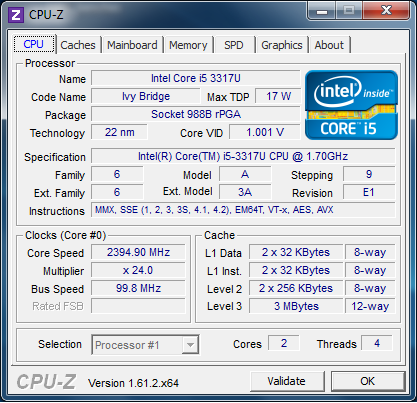 Intel's 3317U from the latest Ivy Bridge generation usually runs very fast. Lenovo provides a dual drive setup where a 32 GB SSD (used for caching) accompanies a 500 GB HDD from Seagate. You get a slight boost in performance with Intel’s caching technology with large storage for your data. The Core i5-3317U belongs to Intel's ULV (ultra low voltage) range. It features two cores at 1.7 GHz each and can be clocked up to 2.7 GHz automatically via Turbo Boost 2.0 to increase the processing performance (i.e. when only one core is loaded). Moreover, Hyper Threading is supported. This means that one processor core can process two instructions or processing threads at the same time. 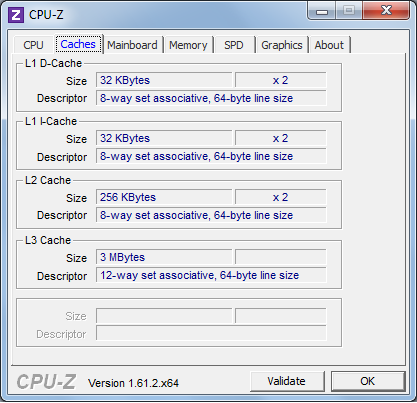 Thus, four performance graphs are seen in the task manager. The user particularly benefits from this during highly parallelized applications such as video or photo editing. In the past it was unthinkable to edit HD videos using a processor trimmed for energy efficiency. This is now possible, although significantly more suitable devices for this than our IdeaPad U410 exist. The U410's CPU-heavy Cinebench performance values are in the lower range when compared to other test devices using the same processor. This is however likely due to the restrained fan management. The ultrabook stays agreeably quiet even during processing-intensive benchmarks, which results in a 2-10% lower performance in the processor benchmarks. Particularly, the single core benchmarks show a slight deficit. This is because the fan's limitation in preventing the temperature to rise as high as in the competition in Turbo Boost mode. A look at Cinebench R11 (single) shows that Turbo Boost is actually at full performance (almost 2.6 GHz), but only for a short time in 2 second intervals. 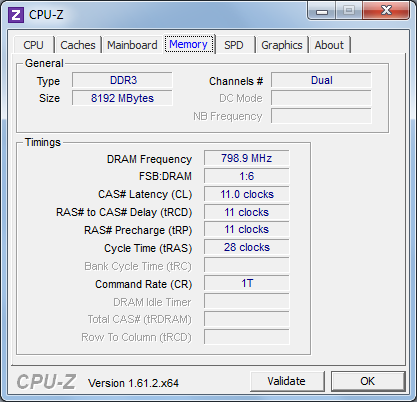 Otherwise, both cores permanently remain at 2.4 GHz during boost. This explains the lower results. However, this is hardly noticed during routine use. 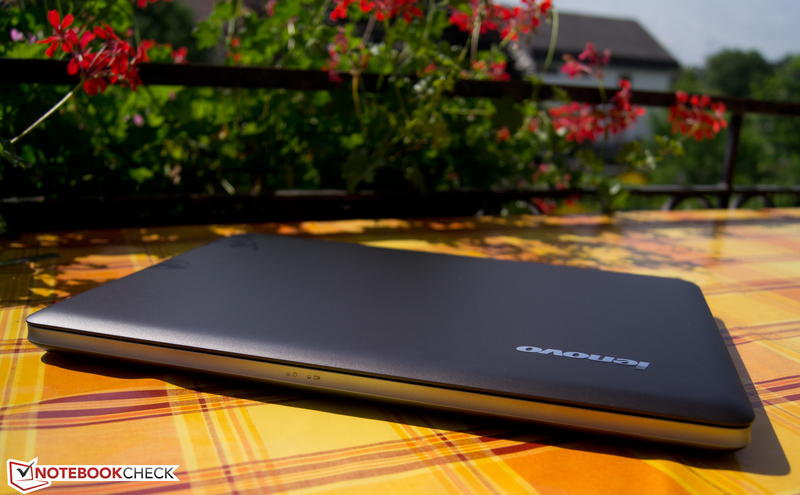 The U410 responds consistently fast and the user will be happy about a comparatively quiet IdeaPad. The overall performance places it in the same level as all test devices with the same processor in both PCMark Vantage and PCMark 11. Here it becomes obvious that more expensive devices among ultrabooks have the lead in performance stakes. The extreme case, Zenbook UX31A, shows who the performance leader is with almost 30% better PCMark Vantage scores and an almost 90% better PCMark 11 score. A comparison with other rivals (like the Asus UX32VD: ca. 30% slower than the IdeaPad) puts the scores in perspective and shows the potential buyer that apples are being compared with oranges. The SSD drives installed in the top models are significantly faster than the HDD/SSD combo in the IdeaPad U410 and Zenbook UX32VD, which want to achieve a balance between speed and capacity as well as hit a certain price point. Buyers can be happy about more memory capacity in Lenovo's U410 than much more expensive versions and receive about the speed advantages, though nowhere near what SSDs can achieve. The U410 manages these modest performance gains by pricing their product at least 100-300 euros cheaper than similar laptops from other vendors. Acer's expensive Aspire S3 ultrabook lags behind by 43% in PCMark Vantage but the Folio 13 is just as fast. Lenovo's concept of fusing the speed of an SSD with the large capacity of a conventional hard disk in this case seems like a well thought out response when regarding the price to performance ratio. 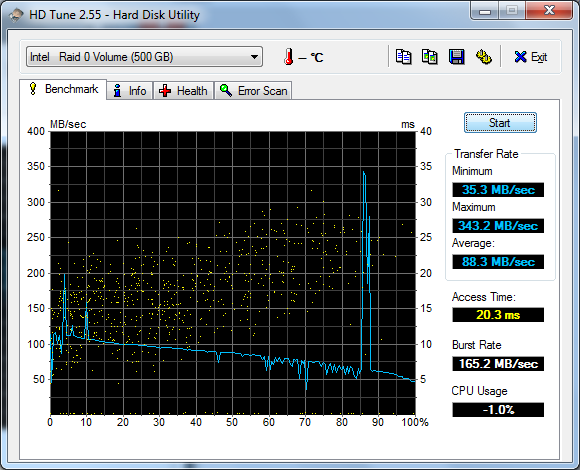 Windows' disk management informs about the partitions and SSD utilization in the IdeaPad. The capacity is actually specified as 32 GB. However, the user can only access 25.47 GB, so installations of frequently used programs (shown as drive D in the file manager, and the boost partition is not listed). According to HDTune, the remaining memory is in a RAID 0 array with a part of the 500 GB hard disk and serves as a boost storage device. Here, frequently used programs and files are automatically cached intelligently so as to enable fast accessing. 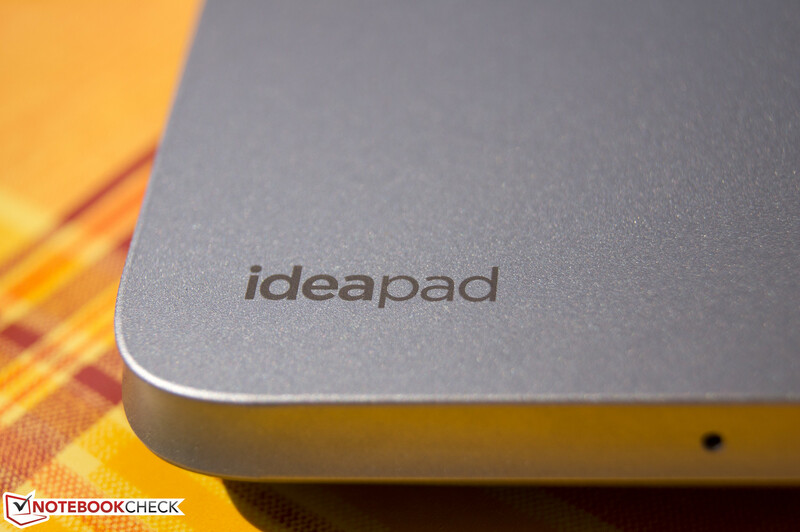 In short, the IdeaPad adapts to the user's habits and speeds up recurring activities. The 500 GB Seagate hard disk performance is average for its class, but often benefits from the boost from the SSD, as described before. Thus, it becomes clear why the average transfer rate of 88 MB/s can even reach a maximum rate of 342 MB/s. If we were to repeat this test several times, we would record several of these peaks because the IdeaPad would register this program as important and reserve more capacity for it on the boost partition. 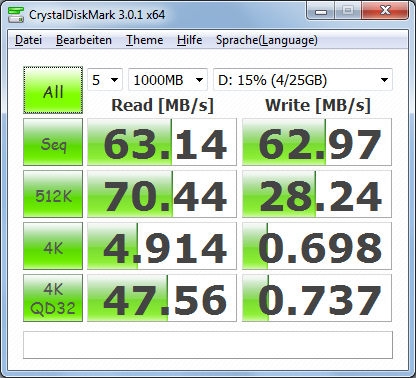 Finally, CrystalDiskMark shows that the read speeds of small files (at system start) are extremely fast. 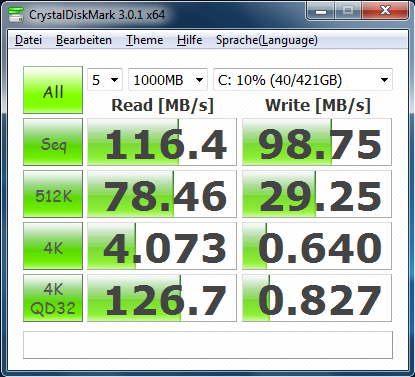 The read speeds of 4073 MB/s and 126.7 MB/s (4K read and 4KQD32 read) clearly show what the SSD and HDD combination can accomplish. The system is up to twice as fast as the competition based on conventional HDDs. Even other laptops that completely rely on fast SSDs can be outpaced by this setup in certain tasks. This solution is only a compromise and if you want really fast storage device, you should turn to ultrabooks solely based on SSD drives. Intel's HD Graphics 4000 integrated solution is supported by Nvidia's GeForce 610M GPU that will take over in case a bit more graphic power is required by the system. The emphasis is on "a bit" here because both graphics accelerators are from the lower end of the spectrum and both usually only accelerate games in low details smoothly. Nvidia's solution should be slightly faster, but the use of this graphics card does not really open up options for more graphic intensive workloads. Both GPUs accelerate HD videos (including YouTube) smoothly and Intel's IGP can theoretically even render several 4K videos simultaneously (although this is likely only in higher clocked desktop alternatives). 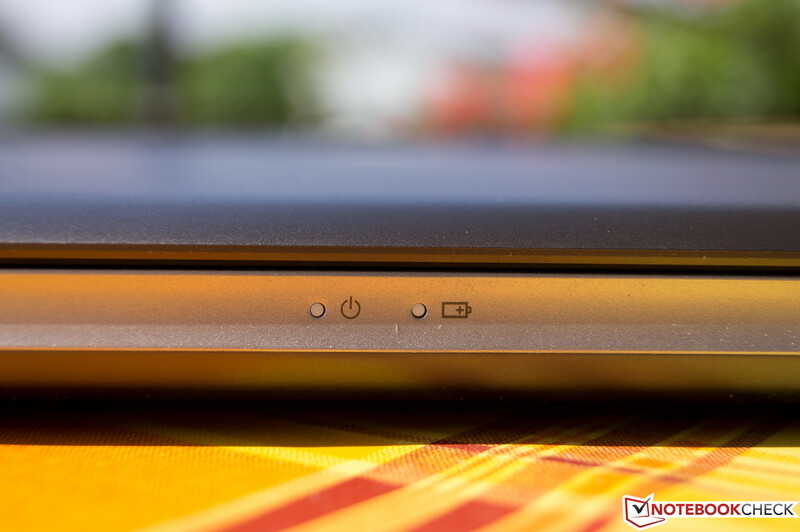 Nothing stands in the way of using the IdeaPad U410 for multimedia entertainment. The 3DMark Vantage scores show a baffling result. Similarly equipped ultrabooks which do not have dedicated graphics and are limited to Intel's IGP solution, accomplish up to a 25% better score in most cases. We investigated the matter and manually set the GPU selection to Intel's graphics solution in the driver and repeated the 3DMark Vantage benchmark. You end up with an improvement of 400 points to 3000 from the 2600 achieved with default settings which is surprising. Note: The test results were all made without tweaking the performance characteristics of the device and the graphics score could be 10-25% better had Intel's HD Graphics 4000 been set in the driver. The GT 610M's gaming performance is usually a bit higher than the integrated graphics (see games). We ask ourselves why a graphics card was procured and installed although it consumes more power, increases the production costs and probably the retail price and is even slower than the existing integrated solution from Intel's new Ivy Bridge generation. Lenovo must have thought a package like this would appeal to the consumer, buying dedicated graphics from a noted supplier. The dedicated graphics does not add any real value in this case. Using the bestselling building strategy game Anno 2070, we tested if the integrated HD Graphics 4000 works faster than the dedicated GeForce GT 610M actually intended for this purpose. This is no fun. Nvidia's solution is 2-3 fps faster than Intel's IGP in medium and high details and the differences in actual gameplay are barely noticeable. We achieve a maximum of 49 fps on the lowest settings, 20 on medium and 12 on high settings in Anno's graphics menu. We recommend using the device's native resolution of 1366x768 and medium details at most because the putative action unfortunately deteriorates to a flip-book. The situation is different in Fifa 2011. Although smooth gameplay is more important here than in strategy games, you can push the controls up to high details, add 2x anti-aliasing and play at the native resolution without fear achieving a smooth 68 fps. To see if the entry-level GPU can also cope with more demanding games, we tested the excellent first-person shooter Metro 2033. The IdeaPad accomplished a quite playable 33 fps at a resolution of 800x600 using the DX9 mode and low details. Medium details and 1366x768 in DX10 mode only rendered the game at 20 fps. So if you want smooth gameplay, you should play on low details and can, where necessary, increase to the native resolution and enjoy the game in 16:9. Generally speaking, an occasional game is quite possible but it would not have been a major disadvantage had Lenovo omitted the dedicated graphics. The performance difference is usually not noticeable. The IdeaPad's noise level can be called pleasant. 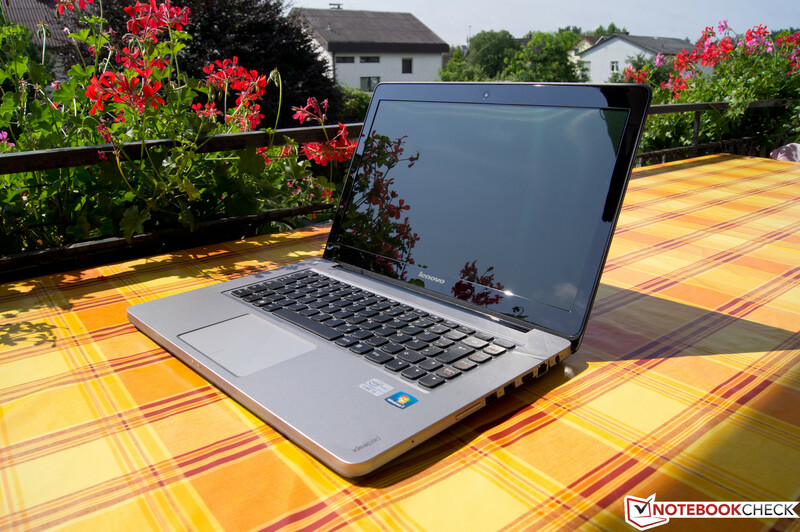 With around 32 dB, the IdeaPad remains fairly quiet during short periods of load, but not completely silent. The fan runs very quietly but is permanently on when surfing the Internet, word processing, etc. It is not noticed after a while due to its monotonous tone. 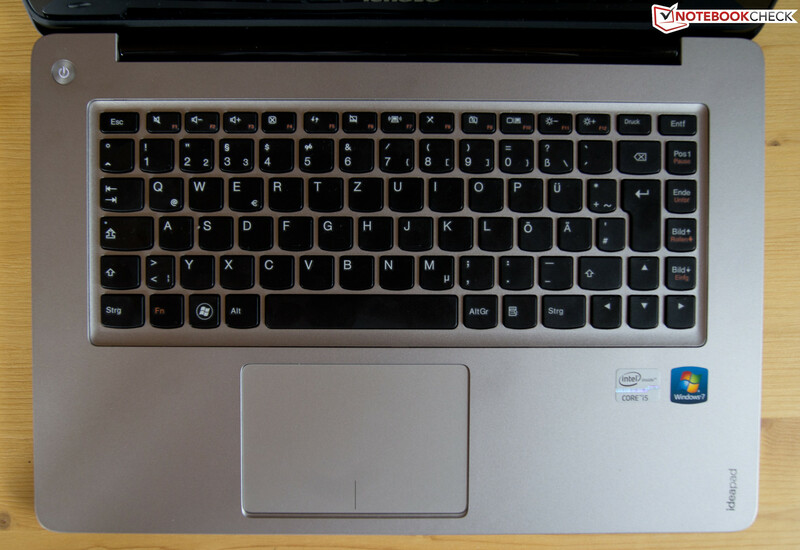 The high-pitched fan noise is first really noticed when the laptop is stressed where the ultrabook nevertheless remains quiet with an average of 36 dB. It never really "squeals" like what is heard often in many other slim notebooks. However, the laptop performance is frequently affected by the fan management, as described in an earlier section. Nevertheless, we believe that an agreeable noise management system should be placed before performance in this category. In most cases at low loads, the IdeaPad U410's surfaces stay nice and cool, which is also due to the permanent running fan that prevents any heat accumulation in the case. The top's temperatures range from 27.6°C - 31.9°C (in the ‘enter’ key area). The bottom reaches 28.7°C - 31.4°C. After an hour at full load, the top surface hits 31.3°C - 43.6°C (the latter is measured on the keyboard's upper center region). The top's temperature is on average, a bit warmer than body temperature, so not too hot. And the IdeaPad's bottom is even cooler at 38°C. These good measurements along with the fact that Lenovo only builds in a narrow vent at the rear enable using the ultrabook on the lap when on the move, without scorching yourself or obstructing the notebook's air circulation. Unfortunately, we could not measure the hardware component's core temperatures due to an access error on the test device's sensor. However, Turbo Boost worked on the same level as in the beginning after one hour of load (2586 MHz maximum). A subsequent 3DMark 06 run shows the same result as in a cool device. The temperature management does not seem overburdened and throttling was not determined. 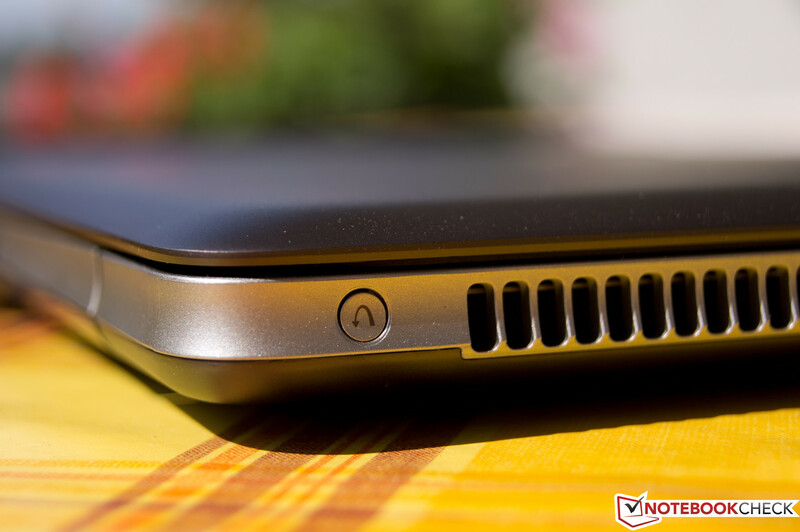 Like in most slim laptops, the speakers do not enable bass rendering, but they do a good job in the IdeaPad U410. The playback of the test music's quieter sequences was silky and clear. The sound was muddier and less defined –at higher volumes and even a bit muffled. Talking about the volume, the U410 can definitely be used for presentations with embedded videos. The speakers’ volume will easily suffice for filling medium sized rooms when there is no sound system available. The device's medium volume setting is louder than the 15" MacBook Pro using the same setting. However, the IdeaPad's sound is not quite as detailed as the Apple device at the same volume. There are no (good or bad) surprises here. It offers solid sound quality when using headsets or good speakers, but you should take care to use a combo 3.5 mm jack headphone and not 2 dedicated jacks for mic and headphone. 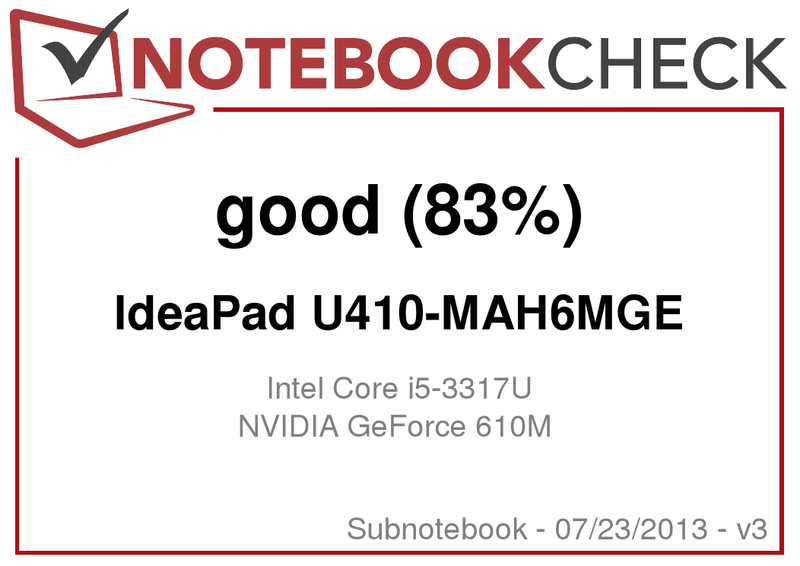 With 7.7 - 13.6 W in idle, the IdeaPad U410 proves to be a bit more power-hungry than its ultrabook rivals (average: 8 - 10 W). That is due to the bigger 14" screen (in contrast to the 13" competition), which naturally needs to be illuminated accordingly. Lenovo's elegant slim model is within the expected range. Its maximum power consumption of 54.8 W is a bit less than what the Zenbook UX32VD consumes in the stress test (Prime 95 + Furmark). The latter uses a stronger graphics card and is able to achieve lower numbers. So our test device is not energy-efficient, but not exactly an energy guzzler either considering the screen's size and good measurements all-round. It is a fact that the U410 is too big an ultrabook. But is that also true for the battery life? Of course, the achieved maximum battery runtime of 6 hours 48 minutes in BatteryEater's Reader's benchmark is unrealistic in most cases. This test is used to extract the maximum from the installed 44 Wh battery (according to HWiNFO) and just simulates scrolling through a text document without Bluetooth, wifi or other "gadgets" enabled and on the lowest brightness setting. This test value could be interesting if you simply want to read an eBook on the go, for example. The wifi surfing test is more interesting for ultrabook buyers. Here, as the name indicates, we surf on the Internet via wifi with screen brightness set at approximately 150 cd/m2. A standardized mix of various online media, such as YouTube videos, news or occasionally even Wikipedia entries (script), is consumed. 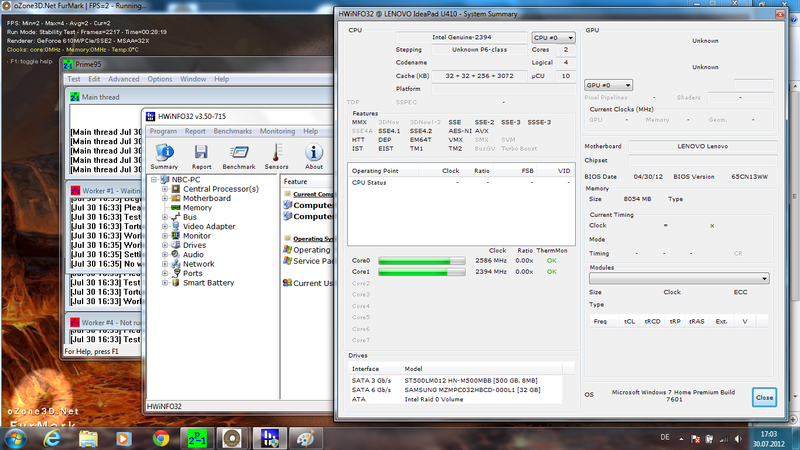 The IdeaPad U410 achieves a good runtime of 5 hours 16 minutes here. 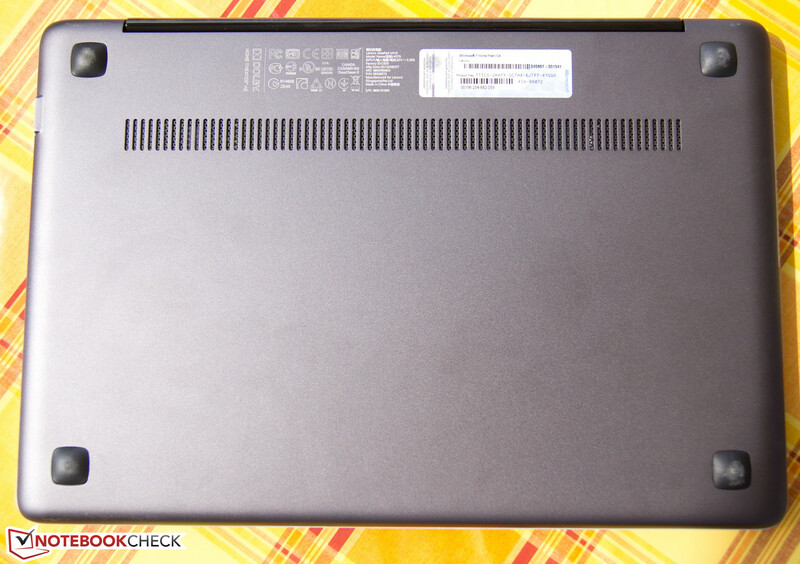 It is about the same as the other tested ultrabooks and in some cases, having a larger battery. However, the 58 minutes that the laptop manages in high-performance mode with maximum brightness and wifi enabled in BatteryEater's Classic test is not very good compared to other notebooks in its class like the HP's Folio 13. 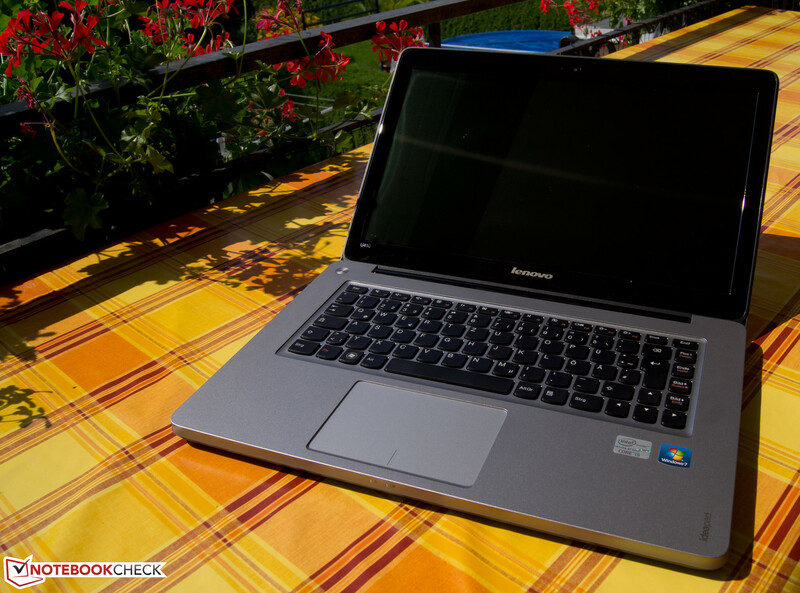 Lenovo's IdeaPad U410 leaves us with a kind of love-hate feeling after the test. It is not surprising since Lenovo devices sway between ingenuity and chaos much too frequently. We are awed by the low price, the design, the feel, the good input devices (extremely good touchpad!) and the impression it makes during use. Lenovo does a lot of things right with the aluminum finish and the rounded edges that a Macbook user would wish for after a long typing session. 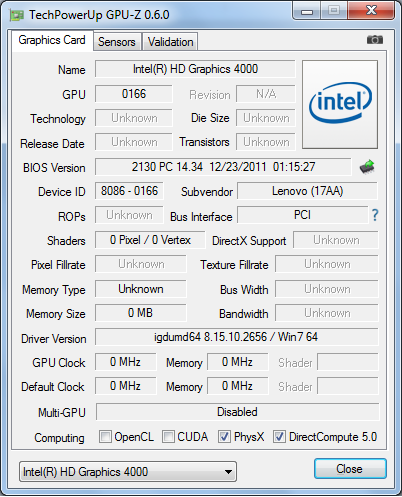 But the U410 is unfortunately not the ultrabook that it could have been. Too many inconsistencies and absurdities ruin the impression. If it is to be a portable ultrabook right from the start, why do manufacturers continue to install unsuitable glossy screens (take a look at the Zenbook UX32VD)? Why does an otherwise great keyboard that has enough room around it have to annoy users with a reduced ‘enter’ and ‘backspace’ keys? 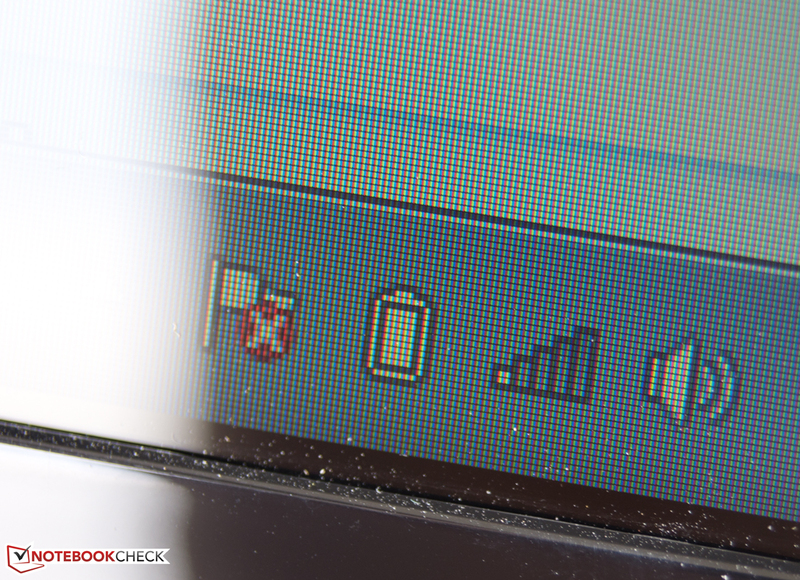 Why does the first test device that exhibits wifi reception problems in the tester's apartment have to be this ultrabook? Why is a dedicated graphics card installed that usually does not even reach the IGP's performance and is doomed to vegetate, useless and disabled most of the time. Why is it not simply omitted and the funds used for a better screen? Or to build in a faster GPU to begin with? A perfect ultrabook would not let such questions arise, and why would the manufacturer senselessly waste materials. Lenovo’s attempt at a larger ultrabook looks to be a disappointment when you consider the package. Nevertheless, the IdeaPad U410 is, after all the complaining, still a darn good bundle for a laptop. The decision to pick it is yours. 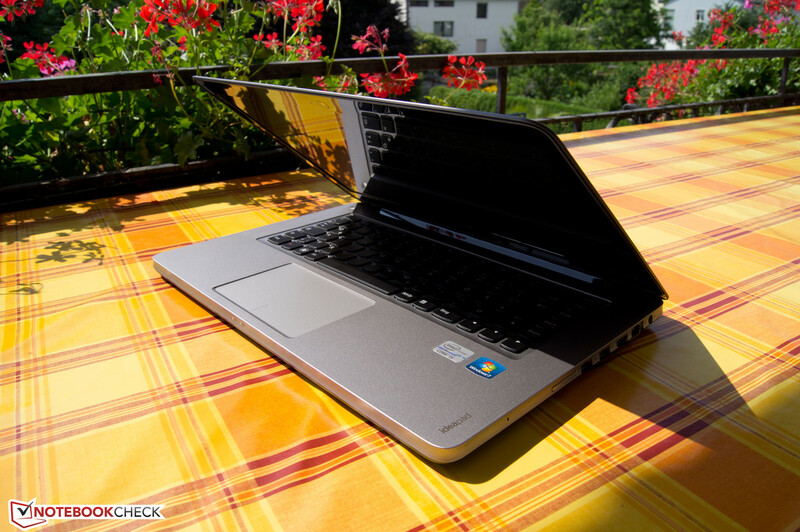 A nice and sunny day: Lenovo's U410 has arrived - out on the balcony! if the right key column were not so cramped (typos!). The 'Home' key is placed quite unfavorably beside the very narrow 'Backspace' key. We simply love the glass touchpad - so accurate and smooth! 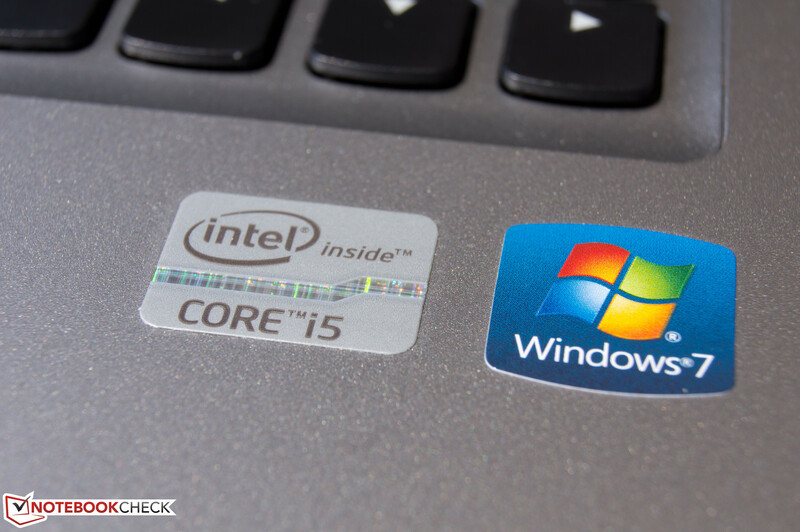 Apart from the Core i5 and Windows stickers, there are no other stickers that would mar the looks. and by the fact that nothing can be upgraded or replaced. The USB 3.0 ports are nicely spaced just like the other interfaces. but it is also possible to connect external headsets via the 3.5 mm combo jack (to right of the picture). like the slim, dark-gray/silver aluminum case. The feel is top class, the corners and edges are nicely rounded. Status LEDs are embedded in the beveled edges. For a better view of the curve, a "corner shot" of the recovery button. 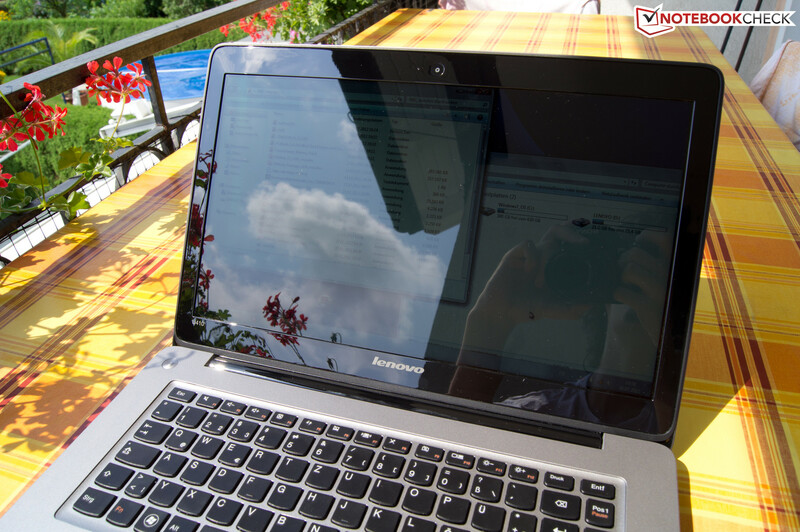 The screen's reflective surface become evident in the sun. However, the reflections are reduced to a degree when sitting away from the sun in the shade. Perhaps the designers did not intend such logo reflections, but looks good anyway. The slim device has a decent opening angle. that can be evaluated when looking from the side. However, the power button's illumination is very elegant (and is also unfortunately the only one with a backlight). The IdeaPad's look & feel is really great. It's been ages since a notebook felt this good! The glass touchpad is very accurate and supports multi-touch gestures. It works smoother and more precisely than expected. Tapping with two fingers triggers a right click and there is a marked field for everyone who prefers conventional keys. Dear manufacturers! Lenovo is not the only black sheep that still treats outdoor suitability of screens like an unimportant matter. But this is very important for devices designed for portability. This is a glaring omission (pun intended). That a dedicated graphics card is installed which offers lower performance sometimes than the integrated graphics. If an ultrabook is to be marketed with a dedicated "high-performance" GPU, it should add value to the product. The smaller brother - the IdeaPad U310 and virtually all devices from the ultrabook category, such as the Zenbook UX31A, UX32VD and HP's Folio 13. Our Top 10 Subnotebook chart offers a good basis for comparison.